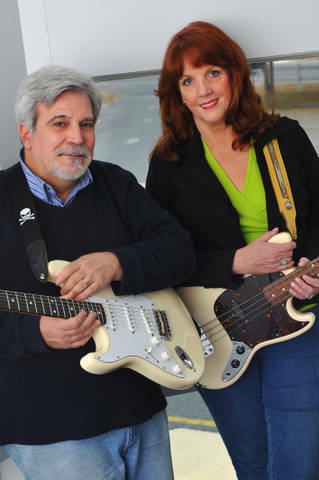 The Problematics are the dynamic duo of Lorraine and Mike Messitt, who perform a wide variety of popular music from ’50s love songs to ’60s British invasion, traditional Celtic to R&B hits. They play concerts, pubs and private events with equal flair, engaging and entertaining audiences and ensuring a highly memorable, original experience. Lorraine’s theatre background and years honing her skills as a musician and singer in numerous blues, bluegrass, swing and Cajun bands blends effortlessly and joyfully with the solid, understated instrumental and vocal skills of partner Michael Messitt, a 25-year+ veteran of traditional and folk-rock bands. 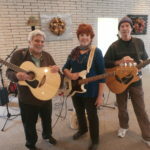 We also have an acoustic trio (2 guitars,1 bass) and 4-piece (w/2nd guitar, drummer) available for concerts, dancing events, and an additional sound person for larger venues. Happy Holidays from Mike and Lorraine The Problematics Trio. We are finishing up the 2018 year with health and happiness…both at the same time! Our schedule has been musically full with the duo, the addition of Bill Boehme in the Trio, and summertime jobs with our always ready drummer, Mike Littlejohn. 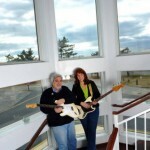 We are managing The Anchor Coffee House concert venue, and play regularly in local The Delmarva Bluegrass Band. But The Problematics are available for holiday and winter parties, not to mention booking into the spring events in Sussex and surrounding counties. Thank you for supporting live music in your community, and have a safe and happy New Year! 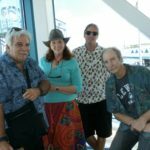 Mike, Lorraine, drummer Mike Littlejohn and guitarist Bill Boehme are ready for the summer fun of ’17. See you at the parties, clubs and happy hours . Thanks for supporting live music at the BEACH! 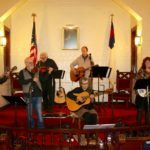 Dana Whittle and Claude Methe of ZIGUE, joined forces with Bill, Lorraine and Mike, and additional local banjo player John Beauchamp for an afternoon of trad Quebecois music, with (opener and finale of bluegrass, seafaring shanties and cajun selections), at local Groome UMC. Look for more future “house concerts” in the future. Join our Facebook, …see above.